Is there any evidence or reason why FIFA is so against adding instant replay to soccer? I find myself seeing many unlucky or just plain wrong decisions made by refs that could be corrected with instant replay. Uncertainty is a part of the game. The referee and linesmen are the arbiters of the action. Instant replay would limit their authority. Football is global. Many places do not have access to the technology necessary to implement instant replay. Football is a fast-paced game with few opportunities for stoppage. Instant replay would unnecessarily slow the pace. "Let it be as it is and let's leave [football] with errors. The television companies will have the right to say [the referee] was right or wrong, but still the referee makes the decision – a man, not a machine." Blatter and others at FIFA have repeatedly argued against using instant replay. But lately, FIFA has begun to come around on the idea. At FIFA's Congress in São Paulo prior to the 2014 World Cup, Blatter proposed allowing managers 2 challenges per game, much like the NFL handles challenges today. Although it's not quite "instant replay," in 2012 FIFA approved two different goal-line technologies to improve referee accuracy: "Hawk-Eye" -- which uses visual triangulation to determine ball location -- and "GoalRef" -- which uses a microchip in the ball and magnetic sensors within goalposts. (Many say FIFA approved the technologies in response to Frank Lampard's snubbed "goal" against Germany in the 2010 World Cup.) 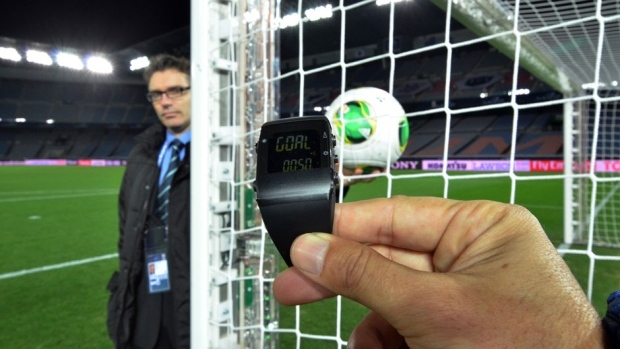 In 2013, FIFA announced it would use GoalControl, a German competitor to Hawk-Eye, at the Confederations Cup, basically a rehearsal for the World Cup. After a successful run at that tournament, FIFA announced it would implement GoalControl at the 2014 World Cup. The Guardian provides a pretty helpful FAQ on the technology. FIFA may choose to implement further changes to approved goal-line technology and referee rules when it meets again after the World Cup. corsiKa touched on time, but I wanted to add what I think is the primary point. Perhaps not for FIFA, but personally. Soccer is a game of motion, timing, and momentum. It is not a game of plays like American football. Scoring and penalties especially are relatively uncommon, while throws and even free kicks and crosses are mostly taken pretty quickly while players jostle for position. Interrupting this flow ruins the game. Ever played on top of a hill with people who kick too hard? Same thing. You spend too much time standing around while the ball's being fetched. I'd certainly be fine with goal-line technology as it's come of age and is reliable and quick, though regardless I still think the real solution is better training for officials. Most errors could be easily corrected by properly trained linesmen. Refs as well, but mostly linesmen. There's no excuse for not being level enough with the play to call offsides and goals properly. There is another problem with applying instant replays beyond just interrupting the flow of the game. It all stems from the nature of football in sometimes lacking breaks in play for quite some time. So how will this cause a problem? Well, let us say that the referee is allowed to use a radio link to the video referee. A long ball is played up to player X, a striker who breaks away into a one to one against the keeper, but who may possibly have been offside. At present the referee (aided by his assistant) makes an instant decision. And if we see he gets it wrong (once we have watched the replay from five angles), we all moan at him. But, even if video replay was allowed, the referee would not stop play to use it, since if player X was onside then the ref has just stopped a possible goal scoring move anyway. He needs to wait for a break in play. So the referee lets the move continue: If X scores then the video can be checked and a goal awarded or disallowed. Even if it results in a goal kick or corner then we have a natural break to check the replay. But what if when play is allowed to continue, X shoots; the goalie pushes the ball out; it is played around by the players of X's team for half a minute or so (still too close to goal to just stop play); and then X's team mate Y dashes into the penalty area with the ball at his feet and is viciously fouled by defender Z... a clear sending off offence. The ball however runs on into the goal. At which point the replay referee sends down a message that the original ball to X was offside! What does the poor ref (aided by modern technology) do now? If he does disallow it (as he should) what about the sending off offence? The defence will argue forcibly that player Z should never have been in the position of having to foul Y since the game ought to have stopped a while ago. And imagine the nastiness from Y's team if Z is let off. Whichever decision is made will not seem right to one team. This is just a simple example using offside. The same problems or worse can occur with just about any decision that needs to be verified by another ref using a video screen. This is why IFAB (the law making body of world football) are insisting that any way of checking if the ball has crossed the line for a goal, needs to be instant. Goal line technology will probably arrive: but I think that anything like the above, that needs even a brief time for analysis, falls into huge potential problems if play has to continue. At least now, right or wrong, an instant decision is made and the game stopped or allowed to continue. Mistakes will often be made, but we all just have to accept that, and get on with the game. So why shouldn't players just accept my imagined scenario too? Because once video technology is accepted for some decisions, then players will expect correct calls at all times... and the free flowing nature of football (unlike cricket, gridiron, rugby which are all played in short bursts of action) is not suited to this technology. Today FIFA approved using Goal-line technology in soccer! Football's lawmakers have taken the historic step of unanimously approving goal-line technology systems for use in the sport. World soccer's global governing body FIFA and the International Football Association Board (IFAB) made the announcement following a meeting in Zurich on Thursday. FIFA intend for goal-line technology to be used at December's Club World Cup in Japan, and if successful it will also be implemented at the 2013 African Cup of Nations and the 2014 World Cup in Brazil. Two systems, designed by technology companies GoalRef and Hawk-Eye, have been approved after going through two phases of FIFA testing. Unlike in cricket, its really hard to stop the game in between a football game. But the FIFA is working really hard to stop this injustice to certain teams (ex: England's disallowed goal against Germany in WC2010 & Chelsea's ghost goal in the FA cup 2010 semi-finals against Tottenham Hotspurs) May be a goal-line camera technology will help FIFA in overcoming this issue. Actually FIFA has changed some of the rules. Not really an instant replay, but still huge progress. The German company Goal Control has been handed the contract by FIFA to provide goal line technology at the World Cup in Brazil. 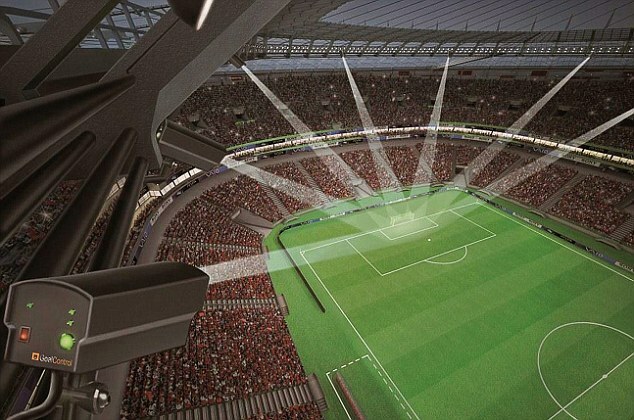 There will be 14 cameras – seven for each goal mouth – mounted at or near the roof of the stadium, capturing images at 500 frames per second, installed at all 12 World Cup venues. They will ensure that no controversial goals are allowed or legitimate ones disallowed. The referee will have a special watch which will vibrate with a flash message reading “GOAL” once the ball crosses the line. The company’s boss Dirk Broichhausen also revealed that the system cannot be hacked as it is an “Off-line” system and did not rely on the internet, assuring that the technology is foolproof. Nearly 2400 tests were carried out to assure that the system was accurate even when cameras were blocked by players, and has minimal margin of error, a plus-minus margin of just 1.5 centimeters. These measures taken by FIFA have given fans and players hope that the tournament will be the most competitive one yet along with being fair and just. There is NO good reason for the failure to implement video plays in professional soccer. Far from "breaking the flow of the game" it would actually prevent all those ridiculous delays where the players protest the referees decision. When a video replay will reveal the truth there will be no point in arguing, just as there will be no-point pretending that the merest touch from an opponent carried the force of a sledgehammer, or that a ball hitting the shin somehow caused a facial injury. We would also get offside decisions correct. It is almost impossible for a linesman to see the position of the advanced forward at the moment the ball is kicked. IN most situations it is just physically impossible. It is a miracle that they get borderline cases right as often as they do. I have watched football all my life and I am sick and fed up of seeing games spoiled by incorrect decisions. It is not as if bad decisions are rare. They happen in just about every professional game in the English Premier League. I am also sick and fed up of seeing rich and fortunate grown men behaving like spoiled brats - but that is a different matter. FIFA likes to present itself as a caring organisation with things like promoting the game in the 3rd world and its RESPECT program, yet youngsters all over the world are being given a terrible example by some of their footballing heroes ... that cheating pays. The only people that can benefit by ensuring that football games continue to be riddled with awful decisions are the cheating players that try to get unwarranted penalties, or to get their opponents unfairly yellow and red carded, or organisations that want to keep the ability to make sure that we get the "right" result in important matches. Most fans, and I suspect most players, want to see results decided by good play, within the rules. Why don't the national organisations simply leave FIFA? The organisation is evidently corrupt, its senior officials are hugely overpaid, and some of them are criminals who have somehow evaded the prosecution that most of us would have faced had we fiddled our financial affairs that badly. FIFA was against instant replays, but not anymore. Not the answer you're looking for? Browse other questions tagged rules football fifa video-review or ask your own question.